Friday nights at Urban Yarns are always a good time. There are so many lovely ladies who come to knit and gab away their evenings. There can be anywhere from 2 to 20 people in out little shop and topics range from family and friends to movies and books. I have met many fun and fabulous women at SnB night (you know who you are). Since I’m not knitting at this moment I’ve been living vicariously through these ladies and I thought I would profile one such knitter. Kristen and I met at either knit nights or during a class, I can’t remember which now, but the first things I noticed was her beautiful cabled cowl. Sometimes you come across a knitter and they just have the very same taste as you in yarn and projects, something to be treasured. I’m always interested in what Kirsten is up to and have even copy-catted a project or two! 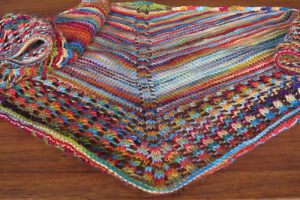 Her lovely cabled cowl is a pattern by Blue Sky Alpacas and the yarn is the lovely Suri Merino. Hers turned out just beautifully. 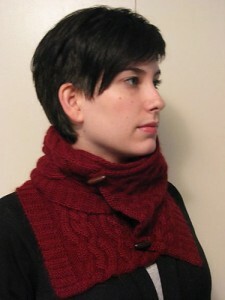 Next up is the charming little Colonnade shawl. Kirsten knit this baby up in Misti Alpaca Handpainted Sock. Kynna came across this yarn a few Fridays back and the knitting crew went nuts! There was a serious run and at least 3 knitters are working on a pretty rainbow project of their own. Kirsten’s rainbow Colonnade will be a fresh bit of colour against the grey Vancouver skies of fall. Kirsten has also been finishing sweaters at an alarming rate! My personal favorite is her Felted Tweed Manu. It’s a lot of stockingette stitch but the finished project is fantastic. The pleats make it feminine and the pockets are my favorite part. 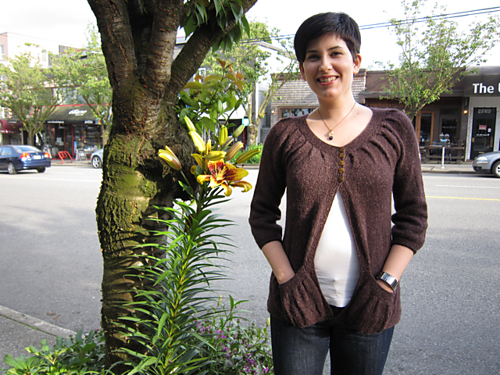 Manu is another very popular sweater on Ravelry, for good reason! So, this is a profile of one prolific and talented knitter. Swing by Friday nights and you are sure to meet many more! This entry was posted on Tuesday, July 13th, 2010 at 12:17 pm	and is filed under Uncategorized. You can follow any responses to this entry through the RSS 2.0 feed. Both comments and pings are currently closed.